This week we had a friend in town so we wanted to try something a little different. 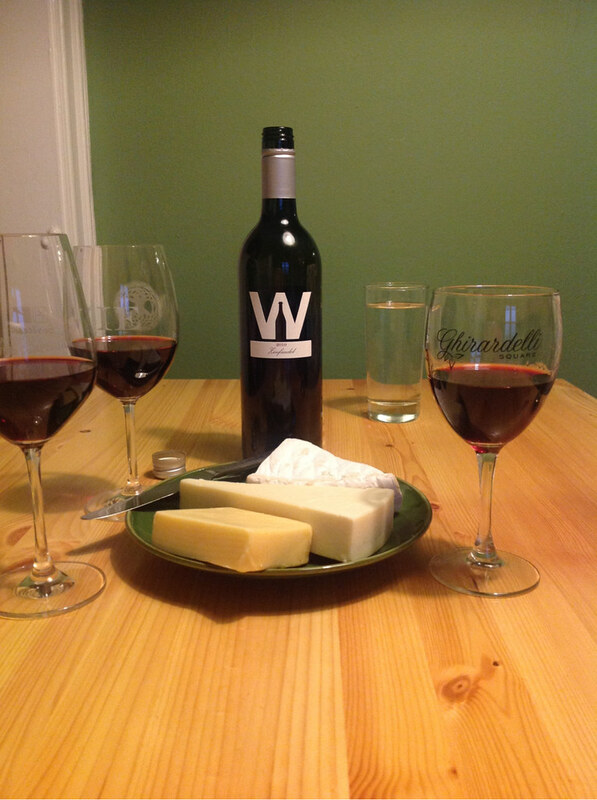 Steve, a fellow wine lover, is also a cheese lover and couldn’t wait to be a part of WineAndCheeseFriday. Because we all love cheese, just about as much as wine, I figured we could each have our own cheese to rate with the wine. Our wine was a Zinfandel made by Winery SF. I really enjoy this wine at work so I figured it would be fun to review. We all agreed that there was a good amount of alcohol in the aromas. Since moving to California, this has been pretty common for Zinfandels. It’s so sunny here that some of the wines can be upto 16% alcohol. Neil identified a cassis aroma and Steve thought it was “medicinal”. When we tasted the wine, I noticed an increasing spice, some fruit and that the wine was light. Steve picked up a neutralized peat and was surprised that the flavor was not overpowering because of the smell. Neil enjoyed the spice, called it flavorful and thought it was a little dry. At work this wine has been described as the Zinfandel for the non-Zin person, Steve and Neil felt this was an accurate description. Since there were three cheeses each of us chose one to review. Steve wanted to try the Brie, Neil went for the Asiago and I had the smoked Jack. Steve felt the Brie wasn’t as chlorine flavored as some others that he’s tasted. He did like that it was smooth and reminded him of unsalted butter. The Asiago had a very distinct, strong odor. We all noticed it when we brought the cheese over to the table and Steve called it a “cat box”, PU! Neil described it as a brine odor but the flavor was barely salty. There was a medium firmness, as well as a creamy and crumbly texture that was almost damp. It seems this week’s items have very different smells and tastes.! I tasted the smoked Jack and noticed it was obviously smoky, had a medium texture and a bacon flavor. We continued with our designated cheeses for the pairing with the Zinfandel. Steve felt the flavors of the wine and cheese reinforced each other well and brought out each others strengths. He thought the Zinfandel brought out the flavors of the Brie more than the Brie brought out the flavors of the wine. Neil and I had a different opinion, for both of us, the cheese brought out the intricacies of the wine. When Neil paired the Zinfandel and the Asiago, he picked up a punch of blackberry fruit, and a smokiness. Since the cheese was stronger than the wine, the cheese didn’t really change during the pairing. When I tasted the wine and smoked Jack together, I found more fruit in the wine and the spice in the finish increased. After we worked with our assigned cheeses we all explored the other pairings. We came to a consensus that the Asiago and Zinfandel was the best pairing because it brought out the character of the wine. And because Steve is a comedian, he said “Once we smacked the wine into shape with the cheese, it became much more respectable!” That’s one of the main reasons we try the wine and the cheese together. There have been a few pairings where we agree that the pairing is better than the wine and cheese alone. As usual, it was great fun and we just about devoured all of the 3 wedges of cheese. Yum! Next Post: Maria and Neil are in Europe, check back next week!